This year I am entering the world of AP Art. Last spring I approached my administration about the need to offer AP for our students and they were excited to bring our art program to a higher level! Even though I have been teaching HS art for 13 years and have incorporated advanced level art into the class I felt overwhelmed by the thought of teaching AP art. As their teacher I feel the burden of making sure they are equipped to be able to succeed and score high enough on their portfolios. I am nervous and excited to take on the challenge! Anyone else have those same feelings? 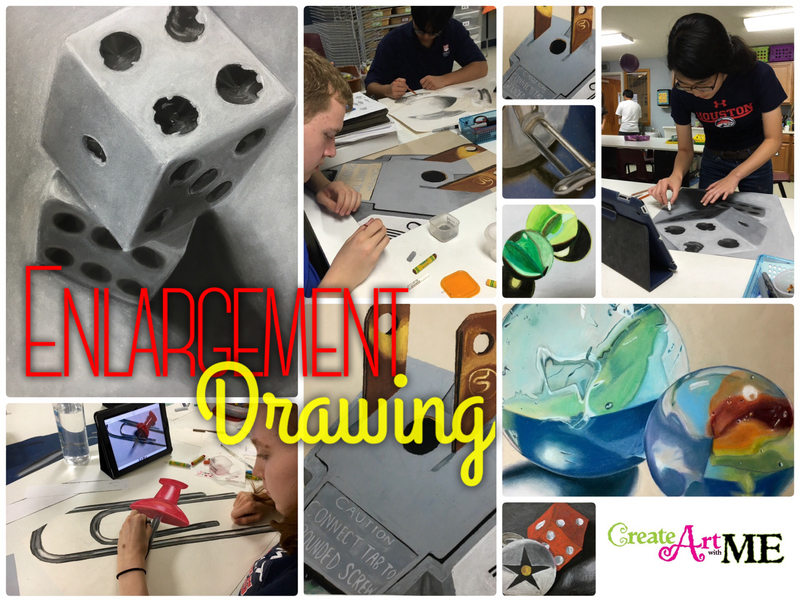 Small to Big – Enlargement Drawing was our first project for breadth in AP and I also had my advanced level students create it as well in hopes that they can perhaps put it in their portfolio if they choose to take AP in the future. Objective: The student will use observational drawing skill to create an accurate drawing of a physically small object enlarged or magnified onto a large sheet of paper (so large it goes off the page on at least 3 sides). 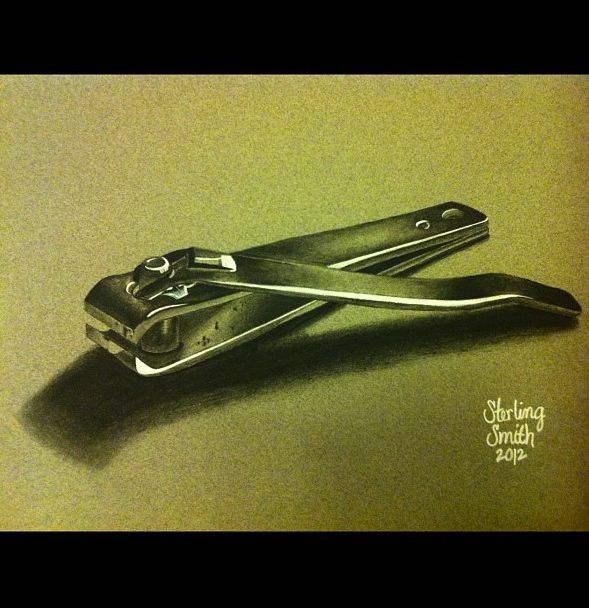 Apply knowledge of the “5 Elements of Shading” to render the drawing with a full range of values. Review “Rule of Thirds” composition technique. Paper or canvas is divided into thirds both horizontally & vertically. The lines intersect at four points. These intersections are visually pleasing areas to place the focal point. The rule of thirds grid can be used to help enlarge the drawing onto the larger paper (just make sure they are the same proportions!). 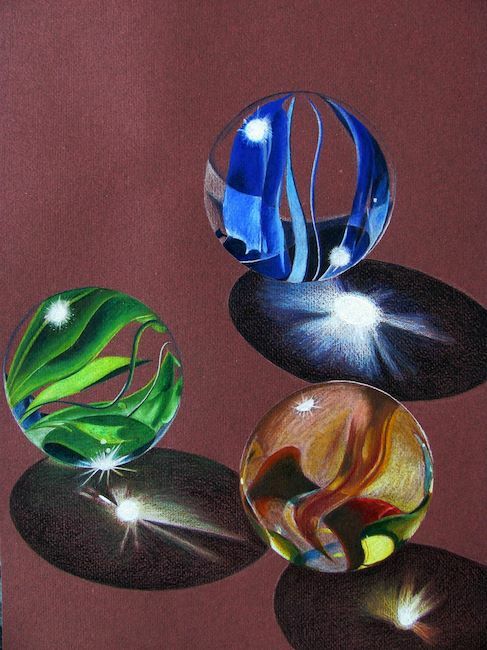 Review “5 Elements of Shading”: Highlight, Shade, Shadow, Reflected Light, and Cast Shadow. Preliminary Sketches: Choose 1-3 small objects to draw (less than 2”). Draw 5 preliminary sketches focusing on an interesting composition that enlarges the objects so much that they go off the page on at least 3 sides of the paper. Project Objective: Create a drawing of a physically small object enlarged or magnified on a large sheet of paper (so large it goes off the page on at least 3 sides). Write name on BACK of paper-no names on the front! Choose the best composition from the 5 preliminary sketches (keep sketching if you aren’t happy with any of those). Use light station to add dramatic lighting & take picture of composition with your iPad. Edit the picture in Photoshop Express & send to printer. Draw ACCURATELY on a 16×20″ paper. If needed, use a quarter grid system to help with the enlarging process. Spray with hairspray/fixative when finished (expect oil pastel). If you choose to use this lesson or to repost it (written info or photos), please link it back to my blog. Create Art with ME.